Classic biker movies encapsulate an entire generation of moviegoers that longed for the freedom of the highway. Jack Kerouac's Open Road fueled the desire of many people to take on the roads of the United States traveling by motorcycle. It is from this book that the concept of the modern "biker" was created. From the cult following of the Open Road and the exodus of people leaving their stable homes for the unpredictability of the road spawned many of the classic biker movies that we know and love today. Those who could not escape their lives for the freedom of the road instead lived vicariously through the characters on the big screen which was larger than life, dangerous and unsure about the world and life. Biker movies are all about cause and effect. Oil Tycoon has your brother murdered because you were dumping toxic chemicals. You and your gang get revenge by burning down his oil plant and making him pay. The stories of biker movies are always harrowing, freeing and pure cinematic kitsch. Easy Rider: A 1969 counterculture hit which starred the likes of Peter Fonda, Dennis Hopper and Jack Nicholson. 'Easy Rider is considered a pioneer of the independent film as it exists today in America. Fonda and Hopper are hippies driving through the southwest, meeting a wonderful mix of good and bad people. Jack Nicholson portrays an attorney that serves to narrate the problems of society against the backdrop of freedom expressed by the main characters. The Wild Angels: Roger Corman's 1966 film about the Hell's Angels which created the biker movie genre. Peter Fonda plays the leader of the Angels who tries to bury his friend in a small town. When the town resists, a brawl ensues. Chopper Chicks in Zombietown: This 1989 B-flick combines two sub-genres that have nothing to do with one another but sells itself on title alone. There is no real need for a synopsis as the title says it all for this Comedy/Horror/Biker B-Movie. Resident Evil it is not, but it gets the job done if you are a B-movie horror fan. Running Cool: A married couple is being forced out of their home by a big corporation. Their friend, a leader of a biker gang, comes to their aid. The Wild One: One of the first biker movies ever made, released in 1953. The Wild One stars Marlon Brando in the title role as the head of a biker gang that invades a small town. Despite the dated material and Hollywood's over stylized opinion of the perfect 50's, it's the performance from the stars that make it a great classic. Psychomania: Schlock B-movie horror at its absolute best, as the head of a biker gang aptly named "The Living Dead" decides the name should be true to un-life. With the help of his occultist mother he takes a dive off a cliff and comes back to life. He begins to recruit others into his gang in order to run off and raise hell. Beyond the Law: Charlie Sheen plays an undercover cop in this 1994 biker flick that has to infiltrate a biker gang. As he gets deeper into the gang, the lines between his real life and undercover life blurs. Me & Will: Jane and Will are two people known throughout the LA club scene but only truly meet in rehab. The story follows along the same lines as Easy Rider with seemingly a lower budget for this 1999 biker movie. 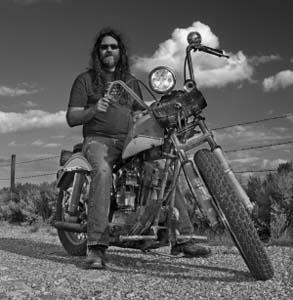 Biker Dreams: This 1998 documentary follows real bikers traveling across the United States from the Sturgis Bike Rally. Lone Hero: A newcomer to the list making its release in 2002. The movie stars Lou Diamond Phillips in an unconventional antagonist role. The film itself follows the scene math of other biker movies as Phillips, playing the lead biker gang leader, takes siege on a small town until one man stands up to take the town back. Some of the films listed above are on VHS and may be difficult to find. Amazon.com can certainly be a great source for buying them. For newer movies like Lone Hero, a DVD should be available. Blockbuster Online or NetFLIX may have them for easy renting. Your local mom and pop store may also carry older movies like these or something close.